QSound Labs offers a suite of cutting-edge, field-proven audio technologies that can propel your products to new vistas. 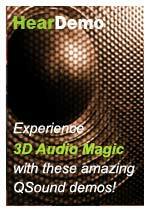 Whether it’s spatial and spectral enhancement of music and video playback, powerful polyphonic wavetable synthesis for outstanding ringtones or interactive three-dimensional (3D) sound placement for gaming and virtual reality applications, QSound’s patented algorithms are sonically stunning and yet pleasingly efficient with resources. Our algorithms are broadly deployed in dedicated hardware, and on digital signal processors and PC host processors at various levels from user applications to plug-ins to driver integrations and fully-embedded core system components. Our engineering department will gladly assist you in choosing the best form and approach for your product plans. QSound can provide design guides with detailed algorithm descriptions, object code or software libraries. Regardless of the path you choose, we back it all up with expert integration assistance and verification support. In fact, the ideal audio engine for your project might well exist already as an integrated circuit or part of a software platform offered by one of our technology partners. Looking for something unique? QSound is always ready to discuss the customization of our technology to ensure that your product’s audio requirements are met to your specification. To learn more about how our high efficiency audio solutions can enhance your products, contact our Sales team today. 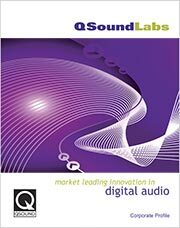 For an overview of QSound, our technology and licensing process, please visit our "About QSound Audio Technology", "Licensing QSound Audio Technology" and "QSound Competitive Advantages" pages or download our Corporate Profile brochure.